Do I really own my career? Yes. And that it is a wonderful thing! While this may be enough information for some of you to keep moving forward with, I understand that for others, this six word response is probably not going to cut it. Let me makes a more compelling case by starting with a short (I promise) story. Some years ago, I remember being two weeks into a mid-level HR role in a corporate. Full of good intentions and energy, but also relatively clueless about the new company I had joined, with only a few ‘fledgling’ relationships in hand. A Senior Leader asked me to have a meeting with one his people to discuss their career plan. I entered the discussion thinking we would probably talk development, but instead was a little taken aback when the person opposite me, who I add I had literally never met (nor had ever spoken to), intently looked at me and asked, “what should I do with my career?”. I must have been silent for an uncomfortably long period of time, because he followed up with – “well – what does the company think I should do with my career?”. This question felt ludicrous to me. Why would this person who I didn’t know, working for a company I had just joined, – ask (or even care) what I thought they should do with their career? How on earth would I know? I remember somewhat clumsily asking what the person what they wanted to do with their career, and was met with a stare equally as blank as I had probably given him. This is the bit I will never forget. The individual looked squarely at me and said– “well this is your job – you need to manage my career”. While perhaps this is one of the more explicit conversations I have had about career ownership, this view that ‘the business’, or ‘the manager’ or ‘HR’, owns a person’s career is something that still seems to be prevalent across all types of jobs, companies and industries. This spins me out a little. I mean, after all, the choices you make about your career are going to be some of the things that will make the BIGGEST impact on your entire life and future. In my head, trying to outsource the ownership of your career to someone else is akin to asking your boss or your business (or even a random stranger on the street)- “am I straight or gay?”, “am I ready to buy a house?” or “should I have kids, and if so how many?”… These are all other big decisions that will have a significant impact of your life and that should be intimately integrated and aligned to your career plan. Recognising that work and life are one in the same thing, by expecting someone else to manage your career, you are be inadvertently giving them control over quite a significant proportion of your life. I like to think of it as taking THE controlling interest in your own career and future. It is about being honest and clear in your mind about what is important, what you want and how you are going to get there. You need to be prepared to do the work it will take, even when it may be hard, even (and especially) when no one is watching. It is about understanding that in your career, YOU will be the only constant (jobs, bosses, companies, countries, and even economies can easily change) and that you are the best and only person that can really help you get what you want. This doesn’t mean however, that your career is a solo mission that you must strive for unaided or unassisted. To be successful in your career, like any other part of your life, it takes a village. It takes a great leader who is prepared to care about you, provide feedback and challenges and coach you. It takes a great business (and HR team) that is willing and ready to value and invest in its people, treat them fairly, and keep them whole. Its take great mentors to help you learn, and great sponsors to advocate on your behalf. It requires a great personal network, (a partner, family and friends) to provide support, inspiration and may even some perspective. Your career works like a team, with everyone playing a part. However, once we all recognise that we each play the biggest part in our own careers, and that we in fact are THE BOSS of our own careers, we can all get on with it and do some great stuff, instead of “sitting, waiting and wishing” (to quote Jack Johnson) for something to happen. And you know what – it feels REALLY good to own it! Like when you get the keys to your first car or house, that feeling of freedom, responsibility and the euphoria of YOU being in control of what comes next. This feeling is something to be treasured and valued, not willingly differed or outsourced because it is ‘hard’. So, I am hoping you are going to walk away from reading this, chest puffed out, standing a little bit taller and perhaps murmuring under your breath– “you know what, I’ve got this”. Because you totally do. Your career is absolutely yours for the talking, and it will be whatever you want to it be. And I hope its super awesome. 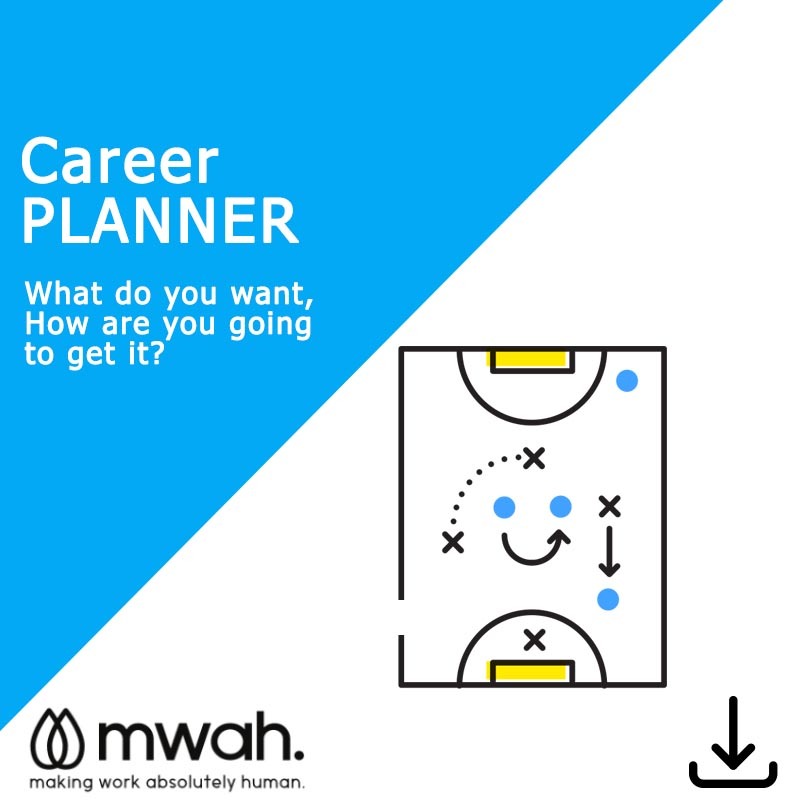 If you enjoyed this article, be sure to check out our Career Planner Template below!